Let me describe to you a man, not yet forty, tall and with a mild and pleasing countenance…An American, who without ever having quitted his own country, is at once a musician, skilled in drawing; a geometrician, an astronomer, a natural philosopher, legislator, and statesmen…Sometimes natural philosophy, at others politicks or the arts were the topicks of our conversation, for no object had escaped Mr. Jefferson; and it seemed as if from his youth he had placed his mind, as he has done his house, on an elevated situation, from which he might contemplate the universe. Description of a visit to Thomas Jefferson at Monticello in 1782 from Travels in North-America, in the Years 1780, 1781, and 1782 by the Marquis de Chastellux. 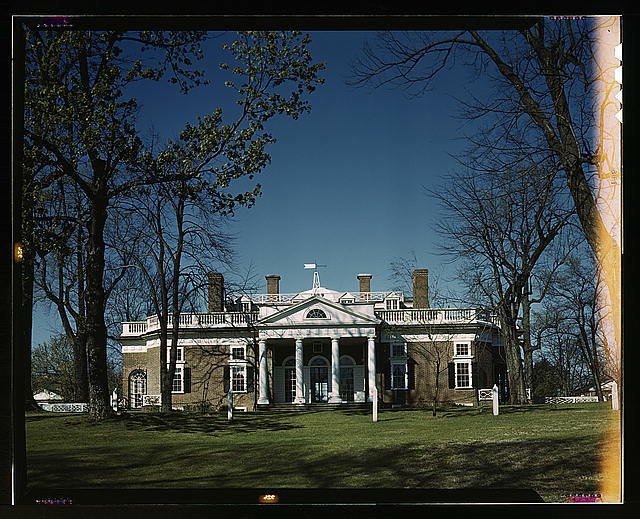 Thomas Jefferson was born on April 13, 1743, at Shadwell in Albemarle County, Virginia. A member of the Continental Congress, he requested that only three of his many accomplishments be noted on his tomb at Monticello: Author of the Declaration of American Independence; Author of the Virginia Statute for Religious Freedom; And Father of the University of Virginia. A man of many conflicts. While he lived a simple lifestyle, greeting guests in homespun clothes and slippers, it is reported that his wine bill upon leaving the presidency was $10,000. He certainly knew how to live well. He believed in a “wise and frugal Government, which shall restrain men from injuring one another,” but that otherwise left them free to regulate their own affairs. In an effort to minimize the influence of the central government, he reduced the number of government employees, slashed army enrollments, and cut the national debt. Jefferson had to deal with the political war waged between his Republican Party and the Federalists. There were many occasions where his personal philosophy contradicted his professional actions. The battles were focused on the nation’s judiciary branch. The landmark ruling in Marbury v. Madison, which established the independent power of the Supreme Court, was handed down during Jefferson’s presidency. Of his relationship with the slave Sally Hemmings, many still debate today. Although he denied the affair, current DNA evidence supports sexual relationships between the two and was indeed fathered two of her children. While he fought for the prohibition of slavery in new American territories, he never freed his own slaves. Some historians argue that he felt it was for their own safety and they were better off at Monticello. However, one still cannot overlook the sacred words “We hold these truths to be self-evident, that all men are created equal,” in light of his ambivalence toward slavery. Time has passed and two hundred thirty years later I wonder…Are these truths self-evident? It’s rhetorical, in my view yes. However, the more important question is when? When will we as humanity act, that all men are truly created equal? Photos and other material from the Library of Congress. Check it out, it’s your library. Welcome everyone to the Thursday weekly Open Trackback Alliance. Trackback to this article while including a link to same in your article, and it will appear below, right before your very eyes. Call it cyber magic if you will…it just works. And if your blogging software doesn’t want to play nice with trackbacking, just use this handy-dandy Wizbang Standalone Trackback Pinger. And for your viewing pleasure here are a couple of watercolors by featured artist Steve Hanks. His beautiful studies of the female form is attracting national attention. An intimate portrait of thoughtful serenity and subtle sensuousness. 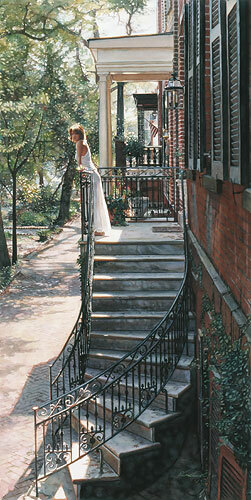 “A healing process can be a lengthy one, says Steve Hanks.” This is, in fact, the final painting in a series of three that have used the ascent of the staircase to track this woman’s passage. By reaching the landing at the top, she has completed her growing process and is ready to move on. This staircase reminds us to take things in life one step at a time, that a promise of reward and satisfaction—the top of the staircase—and a new view of the world around you, is a situation you can help create for yourself. In my paintings, when there’s a sidewalk or shoreline going off into the distance, I sometimes use this area to represent people in the subject’s mind. You may notice that in A New Beginning that there are no people down the sidewalk, and that the background is left blank; the woman has visualized an open road in her future. Additionally, I used a different model for this painting than I did in the first two, to further illustrate the metamorphosis: you are not the same person at the top of the staircase that you were at the bottom. Where are you on your Staircase? A good nutritious lunch is defeated by nothing. It’s very important to begin your day on a full belly. Going hungry has several disadvantages. Having an empty belly may do more than simply stop you cranky. If that you do not focus on your diet requirements then you can certainly fall ill effortlessly. You’ve to understand how much of what our system needs. Unlike our ancestors, we are in possession of a correct understanding of our bodies. There’s a large amount of technology concerned when it comes to keeping our health. Balancing out the food we eat is of extreme importance. We ought to not need inadequate of one kind of food. That doesn’t mean we are able to have too much of everything as well. Even though every individual includes a distinctive human body, our nutrition requirements are relatively same. The foods we eat, pretty much, influence most of us likewise. So we have to have a concept of what our bodies need to remain healthy. After having substantial understanding of our nutritional requirements we are able to look after them. Yet another element is spreading out the food consumption timetable. One can’t eat all his human body needs in one move. He’s to maintain his human body provided with diet time round. Lots of people think that you ought to consume every few hours. Yet the general pattern is to have four normal meals a day. No one has got the time for you to keep eating. Actually four meals a day might be overlooked by some. Regardless of how busy you’re, it’s recommended to at the very least have your morning meal. Kellogg’s cereal deals make morning meal fast, healthier and inexpensive as well. Morning meal is the dinner we’ve following a long crack. Therefore the food we eat is extremely important for our bodies. Our bodies need all of the diet it gets in the day. For more reasons than one, morning meal is considered the most significant food of the morning. So we must be cautious by what we’ve for lunch. The food we eat must have the correct mixture of vitamins. From supplements to proteins, your dinner must have everything. Morning meal provides you with the power all day long you have to work. So every aspect needs to be looked after while preparing lunch. There are lots of foods which may be suggested for morning meal. Yet few individuals have the time for you to eat everything. We are limited by The run to get to work of the time for you to have a good elaborate lunch. Breakfast cereals offer us the rapidly wholesome lunch we want. Because all you have to to do is have a bowl and blend cereal to milk, it barely takes time for you to make your dinner. The first breakfast cereal was cornflakes. Because cornflakes are dull it wasn’t loved by many people. The new delicious number of breakfast cereals makes lunch a pleasure. You’re certain to find your preferred taste one of the thousands available. Deals could make your morning meal inexpensive as well. Deals for Kellogg’s cereals are common because the manufacturer has been creating, the most stylish breakfast cereals for years. Change your budget handling strategy with Kellogg’s Utah and Kellogg’s cereal coupons. The History Behind The Knife And Fork – Why Is Cutlery So Called And Why Was The Fork The Work Of The Devil? No matter where you go to eat there will be a set of cutlery for you to use (excepting, of course, Chinese restaurants where you can obtain cutlery rather than chopsticks if you wish). The cutlery is always the same, one knife and one fork for every course, or a spoon for soup. The designs may vary but the tools remain the same. There has been some evolution in recent times though, to accommodate our desire for fast food and food on the run, which has led to the development of the spork, a half spoon and half fork creation designed especially for one-handed eating. But where did the use of such eating implements come from, who decided that these were the tools that we should eat with? We need to go back to the seventeenth century to see the first use of the fork at the dining table, making it something of a recent addition to the cutlery drawer. But journey back around three hundred thousand years and you will discover that our ancestors were even then using crude knives to the first butcher and then carve the meat for their meals. Though these were very rough and formed from the stone they are the basis for the tools that we use today. When the Iron Age arrived the knives were refined, made stronger and sharper, their shape changed and became something that we would recognize today as a knife. Iron was the metal of choice for centuries, right up until the development of stainless steel in the nineteenth century. The men who crafted the iron knives of old were known as cutlers. This name is a derivative of the Middle English ‘cutellerie’ which is itself derived from a word in old French which can be traced back to the original Latin ‘cutellus’ which translates as the knife. So you see not only has the design of the implement changed very little over centuries the name also remains true to its roots. The introduction of the fork posed something of a challenge to the masses, it was seen as something revolutionary, the work of the devil, after all, it was pronged just like the devil’s own fork. It took a long time for it to be accepted and used by the population of Europe; from its early development in the eleventh century, it wasn’t until the seventeenth century that it was accepted for popular use.